One of the most unique houses in the D.C. area, a landmark of sorts, hit the market Saturday and is going for $1.2 million. It's a home the owner says strangers try to get into all of the time. If you haven't seen it, maybe you've heard of it? It's called the Bethesda mushroom house. The large, 3,700 sq. ft. structure sits on the 4900 block of Allan Rd. The owner, Eddie Garfinkle, gave WUSA9 a tour that he said he wouldn't even give HGTV. "A lot of people have wanted to see the interior. You know we've had, sometimes some would knock on the door and they'd say, 'Can I come in?' and we'd say, 'No' and they'd say, 'Why?' and we'd say, 'It's our home, we live here and you know, that type of thing but you know it's been fun," said Garfinkle. BETHESDA, Md. (WUSA9) -- Fire and rescue officials have cleared the scene of an overturned dump truck in Montgomery County. 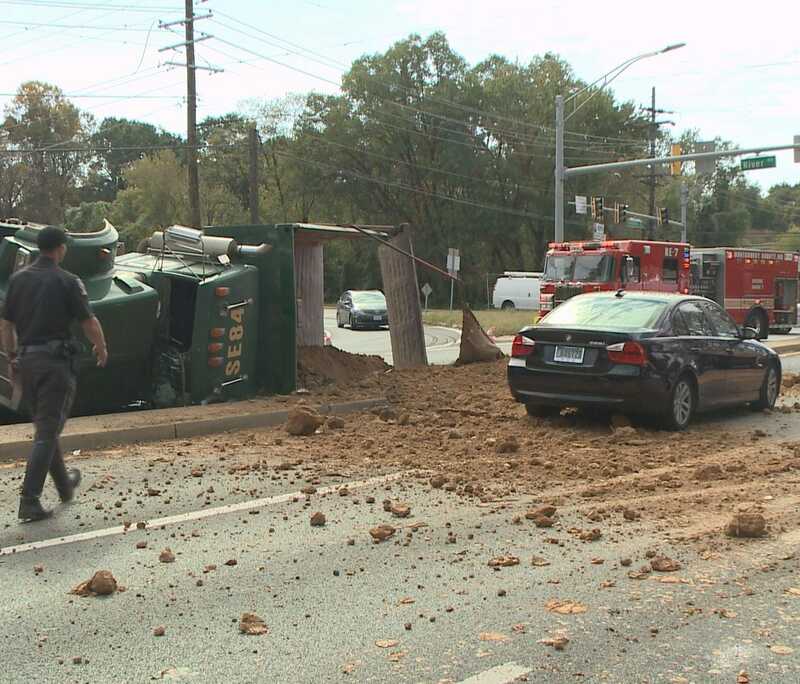 At 11:48 a.m., a dump truck overturned and spilled dirt onto the roadway at River Road and Goldsboro Road, police said. Hazmat crews were requested. BETHESDA, Md. (WUSA9) -- Ebola stricken nurse Nina Pham is now at the National Institutes of Health (NIH) in Bethesda getting the critical care she needs. Pham is one of two nurses who cared for Ebola patient Thomas Duncan, who passed away from the virus. Nina Pham is inside a NIH clinical studies unit that can hold up to two patients at a time. Pham is receiving around the clock care from highly trained, experienced doctors and nurses in the world's largest hospital dedicated to clinical research. Pham will be seen by 10 nurses a day who are working in 12 hour shifts. Patients call NIH the house of hope, nurses say there's no other hospital like it. NORTH BETHESDA, Md. (WUSA9) -- An SUV stuck on the tracks halted railroad service in North Bethesda on Saturday. The vehicle got stuck on the railroad tracks near the intersection of Randolph Road and Nebel Street in North Bethesda around 10 a.m. police said. CSX had to halt service on the track until truck arrived to tow the vehicle from the tracks. The railroad closure lasted about three horus, police said. The driver was not injured and had exited the vehicle by the time police arrived. BETHESDA, Md. (WUSA9) -- The FBI has exhumed the body of a person they believe may be one of the FBI's Ten Most Wanted Fugitives, Bradford Bishop. Bishop is wanted for allegedly bludgeoning his mother, his wife and their three sons to death in Montgomery County back in 1976. The unidentified body is that of man who was killed walking down a highway in Alabama in 1981, court records stated. The John Doe bears a "strong physical resemblance" to Bishop, court records said. WASHINGTON (AP) - Metro officials plan to close three red line stations in Bethesda for 14 weekends in 2016 to repair persistent leaks in the tunnels and to avoid a long-term shutdown of the red line that had been feared. On Thursday, transit officials proposed shutting down the Grosvenor-Strathmore, Medical Center and Bethesda stations for 14 weekends starting in the summer or fall of 2016 in order to repair near-constant leaking issues. The transit agency plans to install a precast concrete archway in the tunnel outside the Medical Center station to stop the water leaks.